Comparative Income Tax Deferral examines the benefits achieved by deferring income or accelerating deductions, with reference to the income tax systems of the United States and Japan. The United States has been at the forefront of recognising the time value of money benefit of tax deferral and of devising methods to prevent tax deferral. Japan, on the other hand, is only gradually placing greater emphasis on tax deferral issues, in light of the activities of foreign companies, and the constant introduction of new financial products which take advantage of the tax deferral allowed under Japanese income tax rules. The book starts with a detailed discussion of the 1948 Cary Brown model and its various interpretations, an understanding of which is key to any analysis of tax deferral issues. 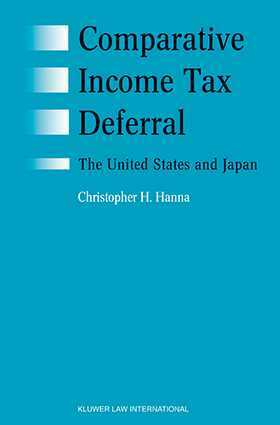 The author goes on to provide a comparative analysis of the different tax deferral patterns that can arise under the United States and Japanese income tax systems, and of methods introduced by the United States to eliminate the tax deferral benefit. A history and overview of the Japanese income tax system is included in the appendix. Principles of tax deferral and time value of money are crucial in an era of globalisation in commerce and finance. They cut across all areas of taxation and are particularly important in the context of taxation of derivatives and other financial instruments. This book is an important addition to the literature in this field and will be of great interest to tax and business law practitioners, investment bankers and financial planners.